It was—and remains—one of the simple joys of childhood. You’re out to eat with your parents, who decided you earned the right to some sugar and a soda. They hand you an empty cup and point you in the direction of the nearby fountain dispenser—and for a fraction of a minute, you don’t feel like a kid because you’re in control over what goes in that cup. Maybe you swirl a bit of Mountain Dew Code Red around like it’s a fine Bordeaux. You sip some Cherry Coke. You down a shot of Squirt. What you have is time and freedom and what feels like unlimited choices. The new Midnight Pig Tap Room—nestled within Pete Miller’s space in downtown Evanston— is shooting for a similar experience. The goal is to help adult beer drinkers reconnect with their inner 9-year-olds by swapping out soda for the ultimate self-service draft-beer experience. Some 30 stainless steel beer taps, gleaming like new sub-zero refrigerators, immediately greet diners. It’s a seat-yourself affair. Pick a table or booth. Saddle up to a sofa chair in the Prohibition-inspired lounge. Or head into a Northwestern University-themed backroom. A server will present you with a plastic card—sort of like one of those Dave and Buster keycards—and direct you to the self-service taps. 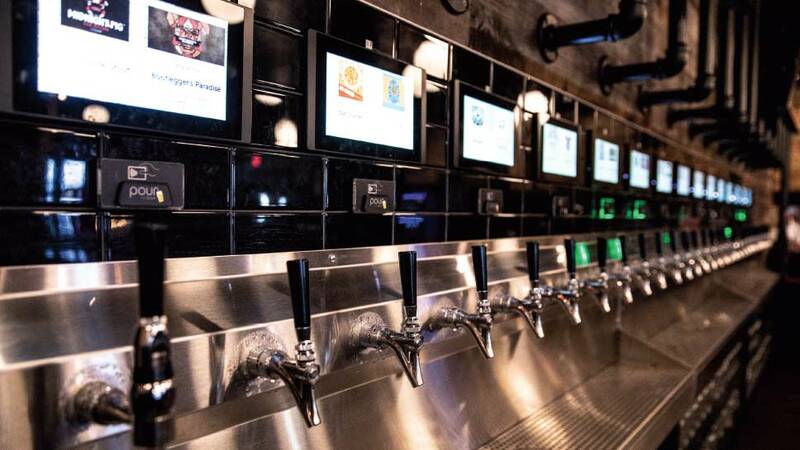 Press the LCD screens positioned above each spigot and you can peruse tasting notes about each beer, which run the gamut from beers made in Midnight Pig’s own brewery to craft brews, mostly from Chicago, Illinois, and the Midwest. You slide your card into the reader, like tucking a card into a wallet pocket, pull back the spigot and pour as much or as little as you like, as the kiosk charges you for every ounce you pour. Think of it as a choose-your-own-brew adventure; the high-tech version of a create your own beer flight. Although you can order anything from Pete Miller’s menu next door, Midnight Pig’s pork-centric, snack-filled menu was designed specifically to pair with its brews. Since Midnight Pig is operated by the same restaurant group that owned the recently departed Tommy Nevin’s across the street, this may be the last place to enjoy Nevin’s famous fish and chips. Fortunately, the rest of the menu does a fine job of combining Pete Miller’s generous portion sizes with a decidedly bistro-pub approach to casual dining. 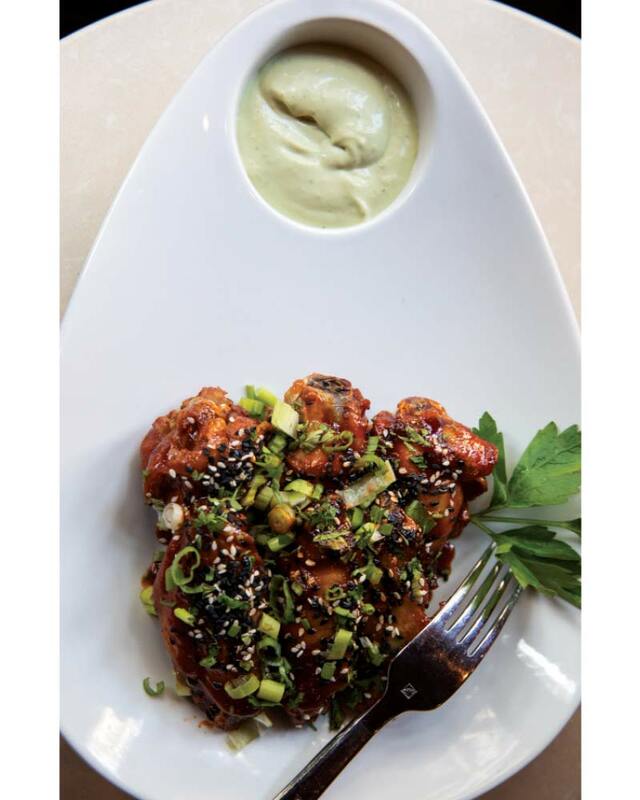 Take, for example, the house chicken wings, which come coated in a sticky marinade often applied to bulgogi. It’s a steakhouse wing: honey butter meets Worcestershire, which gets cooled off with a smooth avocado crema instead of your typical ranch and blue cheese dips. Generally speaking, that’s the kitchen’s strategy: Take a barroom classic and dress it up with comfort food accents. Midnight Pig’s poutine—crisped up with nubs of confit pork belly—has an almost Thanksgiving stuffing appeal to it, crunchy and rich with a bit of pork gravy for extra oomph. In terms of entrees, the sandwiches and burgers provide the best value—although the price of everything is pretty much a steal. Thin slices of pork loin dressed in honey chipotle glaze is a comforting pick, but the house porchetta (while not wholly authentic) makes for a fun twist on a traditional hot dip beef sandwich. Smothered with a mix of manchego and provolone cheeses and some rapini for ballast, the pesto smeared sandwich is then dipped into a warm bowl of beef jus, which works equally well as a dipping sauce for the fries. The surprise, in terms of beer selections, may be how many dessert worthy beers show up, most of which seem designed to pair with the best-looking dessert on the menu: the aptly named Chocolate Brownie pig out. In terms of sweets, it’s a tongue-in-cheek work of art: a forest of chocolate chips are affixed to the side of a giant glass goblet with a thin layer of chocolate. Inside sits a giant scoop of vanilla ice cream covered with a warm porter spiked ganache topped with two triangles of brownies poking out from the top like ears. You can’t help but smile when it arrives—it looks like a giant chocolate pig staring back at you—a reminder that Evanston has a fun new place to “pig out” on beer at for the fall and beyond.